Hello everyone, my name is Kenny Roussey and I am proud to be a new photo archives intern at the Jewish Museum of Maryland. 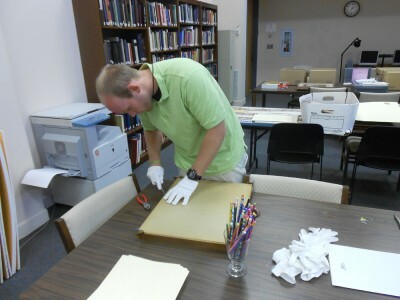 What brought me here this summer was a combination of my love for history as well as my past experiences working in the University Archives at University of Maryland College Park (http:///www.lib.umd.edu/univarchives/). While working there, I enjoyed searching for the answers to reference questions and of course getting to see all of the really cool “stuff”, my favorite item being the actual terrapin turtle that the school’s mascot was based on. The turtle was also the model for the terrapin statues around campus. 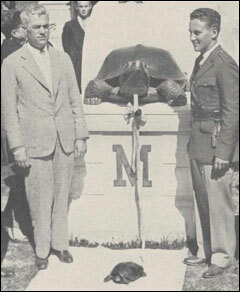 A photo of the terrapin unveiling the original statue can be seen below. My work at College Park mainly consisted of processing archival records from the past presidents of the university, but I was also able to work with photos and objects occasionally as well. Since I have been here at JMM, which has only been one week, I have already learned so much. Things are a lot different here than at Maryland and I am doing a lot of different things. It is interesting to go from working with paper and letters all of the time to now working with photos. Working with photos as opposed to paper documents requires a bit more care with handling them. I have also had the opportunity to learn how to use the database program Past Perfect which I had never used before in the Archives at University of Maryland. In my second week I am starting to get the hang of things but I know there will be plenty more for me to learn. It is great to have the opportunity to work in a Jewish museum and broaden my scope. My favorite part about working here is learning about the strong Jewish community that once called this area of Baltimore home. I really look forward to the rest of my summer here and know the internship will prepare me well for whatever I choose to do in the future.